Robert H Frank contends that while Adam Smith is credited as the founder of economics it is really Charles Darwin who is more important. His concern in this book is about hard right wingers who to paraphrase are too short sighted for the good of everyone. Referring to our current economic crisis that started in 2008, he deplores that the rich seem hell bent on lowering expenditures and keeping taxes lower for them. They claim the deficit is the most critical problem, but many readily admit they hate taxes, big government and regulations. Robert points out that in fact if roads and bridges are not repaired when men are idle and borrowing is cheap these repairs will cost even more as time goes by. There are no winners, not even rich people who think they are avoiding another "theft" of their property. Throughout the book Robert gives examples of short sighted thinking that hurts not only poor people, but also rich people. Perhaps more importantly the author points out some of the psychology and philosophy that erroneously support the resistance of the right wing. For most humans happiness seems related not so much to what we absolutely have, but how we compare ourselves to our neighbours, relatives, work mates and friends. Not every issue is "positionally" important, but for many people they measure themselves with such factors as the size of their house, the prestige of their car and with scarce items. Often the really rich bid up prices on some of these items and in turn that can force up pricing all the way down the line. As part of the argument Robert uses the example of hockey players choosing not to wear helmets when given the chance, but at the same time would like to see a regulation forcing all players to wear helmets. They want an edge, but they realize there is a risk. On another field, armament agreements are made because both sides realize they cannot slow down arming up which gets very expensive and risky. In fact the rich are in a similar spot as the hockey players and the statesmen. If they gain more money by lowering taxes they will just bid up the price of scarce desirable goods. They will also lose out on desirable public goods such as improved roads and bridges, education, science, etc that are necessary and desirable to keep pace with the rest of the world. Robert assumes that ideologues will not be moved by his arguments, but hopes that rational libertarians will appreciate his perspective. He realizes progressives think that rich people are greedy and cold hearted, but Robert thinks (and backs up his ideas with solid logic) that it is not just greed in absolute terms, but short sighted greed in relative terms. There are a lot of cliched myths that are trotted out as truths to be beaten down. Examples include: "the government is the problem"; "Taxes are theft". Many rich people dismiss luck, attributing their success to hard work and talent. The author says there is an element of luck in everyone's success, whether it is genes, nurturing or timing. Small differences are magnified in a lot of winner take all situations. Many pursue the large payoffs, but only a few are fortunate to achieve the goals while many worthy pursuits fail to attract talent. Entertainment, major league sports, hedge fund selling attract more interest than science, engineering, education. He has a host of suggestions that seemed based on the idea that anything that is taxed is discouraged, so we should tax harmful things. His critics say that is social engineering and he really doesn't deny it, admitting that all laws are forms of social engineering. We have laws against homicide and theft as an attempt to reduce them. His favorite idea is a consumption tax that is calculated by reporting income and also reporting savings. The difference is considered consumption and can be taxed on a progressive scale. More conventionally carbon taxes and sin taxes are suggested. Those who really want what is taxed will not be regulated out of doing so, but if they value other things to be purchased will quite willingly find ways to reduce taxable expenses. At the same time we will have public goods paid for. If you haven't got time to hunt up the book and actually read it, you might find this link http://www.youtube.com/watch?v=M8j1e-oT0UQ to a video very informative and it might persuade you that maybe an extra effort would be worth it. This book is another inspiration from Steve Paikin on TVO. I don't want to rely on Steve, but he and his team are very good in their selection of worthy topics and how to bring out interesting perspectives. 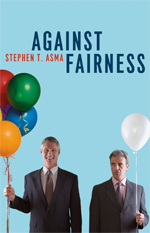 The philosopher author, Stephen Asma appeared on TVO with Steve Paikin a few weeks ago. His premise for his new book stunned me and an investigation seemed in order. It seemed to me that the problems of the world boil down to the fact that it is not fair. Anything that can be done to make it a somewhat more fair world is worth doing. The next few paragraphs are about the baggage I carried to this investigation. At University one of the things that still affects me was Plato's "Republic" At the time it seemed a solution to the world's problems. Basically children were not raised by their parents but by the community itself. Who was given the opportunity to make money and who made decisions affecting the community was not decided by family connections, but by tests given at critical ages. The idea was to separate money from power and as Stephen Asma points out that reasonably assure disinterested (and therefore more just) decisions to be made. In other words your career options would be decided on merit not nepotism. I grew up in a fairly typical Canadian family. I knew my grandparents (have lived with both grandmothers at various stages) my aunts and uncles and cousins. With five different siblings we now live in 5 different cities (at one time 6). I felt family connections, but nothing like what I married into. Family is everything. At times I have felt it suffocating, but on the whole I love it. I have benefited immensely from the support and concerns of my in-laws and I am not alone. They have all benefited from close connections. There is a feeling that no matter what the outside world does we will stick together just like we enjoy each other's company whenever practical. Any social system has to accommodate human nature. The idea of equality may have some merit in an abstract sense, but in practice it doesn't always work. The author, Stephen Asma, admits that there is no one more precious to him than his son and the rest of his family. Favouring your relatives is noted as nepotism and is considered a form of corruption when it comes to business and politics. Ethnic networking has helped many deserving individuals crack the establishment. Other forms of networking might seem artificial, but as we align ourselves with a wider group of people who share something in common (sometimes only by attending a networking group) we extend our own power. Aside from social pressure another factor in nepotism is that people naturally trust people they know more than strangers. There is a natural chemical bonding established just after birth, usually between mother and child. These bonds are critical for survival. We humans retain a capacity to bond with others throughout our life, but family bonds are very strong. Stephen has used examples from China and India to point out that in these societies family loyalty does come first and they look askance at suggestions that we treat strangers better than family. From other reading I am conscious that in fact societies can only grow if we find ways to avoid killing strangers. In our complex cities it is common to walk by hundreds of strangers every day which in other cultures would cause a great deal of anxiety. One of the themes seems to be that in our egalitarian society we have developed the concept of charity, but Stephen asserts that favouristic societies can also develop the concept of charity and acceptance of those different or worse off than ourselves. Every day we make countless choices, most of which impact on both our families (plus other favorites) and society in general. You may feel an obligation to one goal or another, but I now think it is legitimate to give your family first consideration, but probably not a good or fair idea to ignore the greater good. Peter, my wife's stepfather has been married to my mother in law for over 15 years. He still loves swinging the golf club. Most of all he loves people, like very few people I have met. At his recent 90th birthday celebration were a lot of relatives, but also a lot of friends. Friends he knew from work and golfing. One example of how he generates friends is that despite being very Italian, he became golfing buddies with my late father- in- law's (a wonderful man himself) Ukrainian relatives. Peter gets invited to a Ukrainian golf tournament each year and loves the whole experience. Through Peter I have gotten to know his son Sam, daughter in law Lisa and grandchildren Nicole and Greg and great grand-daughter Chloe who have all enriched my life. Sam who helped organize this get together made a little speech that reinforced my own opinion of Peter. Peter was always there to talk to his young son, Sam. Peter didn't behave like a lot of fathers, he asked his son questions and wanted to know what his concerns were. When Sam was trying to make a decision, Peter would ask what the other person was thinking. Then how would the other person respond to what Sam might decide. Then how would Sam respond to that. Going through that process helped Sam make better decisions. Peter has many conversations like that. He doesn't pretend to understand the circumstances in anyone's life, so he asks a few questions. At some point he will relate his own experiences in a similar situation. I remember one experience when I was trying to prove a product I was selling could be used on a golf course. My experiment didn't go quite as planned. I was trying to prove my product could clean up oil from grass. I poured oil on grass growing between a sidewalk crack. I got distracted and it was longer than intended before I poured my solution on it. So I tried it again this time with less time between. Both efforts seemed to fail and I gave up. A few weeks later I noticed that grass was growing on my second effort but not my first. I couldn't figure out what it meant, until Peter questioned me, and soon he analyzed with only a very slight hesitation--oil kills grass, however if you are quick enough you can salvage the roots to regenerate. On a golf course there would be no concrete to restrict the spread of roots. With Peter I appreciate more the value of family. He expressed his concern that we all put in so much effort for his birthday, but we tried to assure him we just wanted to celebrate with him. Watching him with family and friends is awe inspiring. A regular part of Peter's life is keeping in touch with his friends and relatives. Photos: At the top Peter at his happiest with family, this time great grand daughter Chloe. Sam, Peter's son facing the camera with some of the guests behind him. Peter got around to visiting his guests of all ages. Selling is one profession that has very low public esteem. For some it reeks of poor ethics, for others of ostentatious behaviour and for others is just too difficult. 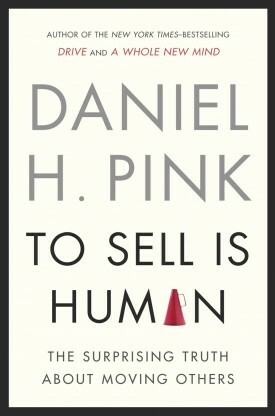 Daniel Pink did not consider himself a salesman and his general thinking was that it is a job with declining prospects. However a closer look revealed that selling is more common and important than ever. Daniel realized that he himself is in sales. He added a category he calls "non sales selling" and chances are many of you are in the same category. "Non-sales selling" involves almost everyone. There are a lot of worthy ideas that don't get executed because no one has been able to sell the idea. Each day however people like yourself do sell their ideas and get things done that benefit many others. And even more common, many people fail to sell their worthy ideas. Selling has changed, not only our understanding, but conditions. Before more modern times the salesman had the knowledge and the buyer was dependent on that knowledge. Now the tables have turned and the buyer often knows more than the seller. "Always Be Closing" was a phrase common to selling and really offended a lot of people as presented in the movie "Glengarry Ross". Daniel updates the ABC acronym to "attunement, buoyancy and clarity." Attunement simply means understanding your customer or prospect. Buoyancy requires you to deal with rejection (the real reason people give up selling). Clarity means identifying the real problem or opportunity. Sales techniques suggested by Daniel are less manipulative, but practical. Questioning and listening are key. A question I also found very effective at opening conversations at trade shows is "Where are you (folks) from?" It is more important to understand the customer than to trap them into an unwise purchase. Pink suggests websites where you can learn aspects of selling through interaction. A change in attitude is to see yourself as a servant. It is not satisfying to feel you have to put one over on a customer in order to make a living. It is also not effective over the long run. It is more satisfying to realize you are really meeting a need. Daniel has a short section on commissions. I have spent a good hunk of my life selling on commission and can appreciate the benefits, but I have also seen some of the bad aspects. Commissions can encourage unhealthy competition and unethical manipulation. I remember a contest where we were allowed to bend all the rules and in the end it created a lot of bad feelings. I also remember another contest where there were two components--an individual goal and a team goal. If you achieved both goals you got a bigger prize but as long as you achieved the team goal everyone got something. The advantage here was that we did achieve a high goal and had a lot more collaboration. A few years back I stumbled on "Drive," another book by Daniel and bought it with a birthday gift card. I originally read Daniel Pink because of his thoughts on motivation and he demonstrates that there is more to sales, business and life than just money. I highly recommend that book as well. To end I would like to borrow a quote used by Daniel at the beginning of 'To Sell is Human". He borrowed it from Arthur Miller in the Death of a Salesman with a comment aimed at Willy Loman, "The only thing you got in this world is what you can sell. And the funny thing is, you're a salesman and you don't know that ." By now you should realize you are all sales people. Anyone who successfully writes about science to the non scientific public is subject to criticism, some no doubt valid. However the average person without a scientific perspective, needs to understand that most of what we think we know is really superficial. 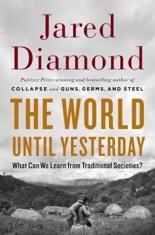 Jared Diamond cuts through a few layers of standard thinking without claiming to provide all the answers. I have read four of Jared Diamond's books and to a significant degree they all have deepened my understanding of the world. What surprises me is that is that at bottom Jared is an ornithologist. That preoccupation prompted him to visit New Guinea where there are many interesting birds to study. New Guinea is unique in other ways. It has the densest concentration of languages found anywhere in the world. It has many variations in environment. Over a period of 50 years Jared has come to learn many unexpected things, appreciate different viewpoints and to analyze what this means to him personally and the world he comes from. 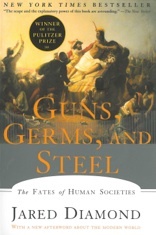 The one that had the most impact for me was "Guns, Germs and Steel." I had seen a portion of the documentary on television. The basic premise was to explain why "civilization" developed the way it did. Modern people seem to feel that it was all decided by superior races of man. It has always bothered me that in our egocentric world we all think whatever we are is the centre of the universe and everything else is a poor imitation at best. Jared with a lot of research countered that there were geographical bands of edible food and domesticable animals that made it easier for these advantages to spread. Germs played a role in that because civilization started when food could be produced and stored more efficiently it allowed cramped conditions which fostered diseases. Urban dwellers developed immunities after a few generations, but spread these diseases when they explored other parts of the world. Smallpox and measles killed off a large portion of resisting natives of other areas. Steel developed along logical lines, but allowed those who mastered it to have harder, sharper weapons and more effective armour. The bottom line was that civilization had much more to do with geographical circumstances than the superiority of any one race. "The Third Chimpanzee" was actually written a few years before and was an earlier version of many of the same themes. Humans and chimpanzees have a closer genetic match than chimpanzees do with gorillas. "Collapse" was written to help explain why different societies collapsed. He pointed out ecological factors.. The one phenomenon that was most common was the loss of cheap energy, often the result of ignorance or short sighted thinking. The most unifying example seemed to be wood from trees. Wood was not only critical for building, but also when burning an important source of energy. "The World Until Yesterday" The contrast between New Guinea and America prompted him to make many observations that he extended to include other traditional societies and modern Westernized nations. In many ways it would seem desirable to advance from simple traditional band of humans to our modern complex states, but Jared would argue that perhaps we could still learn from our "simpler" fellow humans. By no means does he suggests that everything is superior in simpler societies. One perspective that uncovers some basic problems is how we deal with strangers. Primitive societies, for good reasons are fearful of strangers, but bigger more sophisticated societies must overcome this or we might be at each other's throats more commonly. On the other hand Jared found that some primitive societies are very good at mediating. Primitive societies have personal conflicts but their focus is different in many cases. Their focus is on restoring relationships rather than just restoring property. A key difference between primitive and modern societies is in entertainment. Primitive people rely a lot more on talking to one another than on the many modern forms of entertainment. While in Borneo, Jared learned many different dialects as did those he dealt with. He noticed this seemed to boost mental capacities and encouraged his children in this regard. For some of my fellow readers Jared may seem superficial and they can move on to more scientific explanations. A few of my readers might already come from that direction and I cannot quarrel with their observations, but I think for the majority of my readers people like Jared Diamond and the late Carl Sagan help us to realize that there is more to the world than previous mainstream assumptions. To help relieve the world of its ignorance we need more popular explainers of deep science concerns. True scientific understanding is elusive, but the pursuit should be respected and encouraged.